MIAMI -- Two years ago the Ramos family moved into a small house in the Little Haiti neighborhood here. They did so without a title, a lease, or permission from the property's owner. After the father's construction company shut down, a victim of the housing crash, they couldn't pay their rent. Their possessions were literally thrown on the street. "For a time we were basically living in our car or at our friends' houses -- pretty much without a home," Mr. Ramos said. Now the Ramos family, naturalized citizens who spoke through an interpreter and asked HuffPost not to use their first names for fear of being kicked out, have succeeded in making the house a home. They cleared out the trash that drug users had piled in mounds. With a leafy lawn and a couple of dogs barking happily, the place looks pretty comfortable. "For myself as a mother in the United States, this is the place that I've been the happiest in," Mrs. Ramos said. "And in my consciousness this feels right. Instinctively it feels right." Many would simply call it squatting. But Take Back the Land, the Miami-based group whose members helped the family move in, calls it a home "liberation." According to the Census Bureau, in 2010 there were 1.6 million homes sitting vacant in Florida. A 2010 report estimated that 57,643 people go homeless on any given night. In between that unused capacity and unfilled need stands the law, which protects banks' and other owners' property rights. On Tuesday, Occupy Wall Street will take the group's unorthodox anti-foreclosure tactics national. Activists will move to "Occupy Our Homes" in a nationwide series of civil disobedience actions, challenging the big banks over the thousands of vacant homes across the country that lie empty even in the midst of a homelessness and foreclosure crisis. "Here we have a chance to occupy and liberate: it's a one-two punch and that's what works," said Max Rameau, the Haitian-born activist who has braved and sometimes endured arrest while defending families from eviction as part of Take Back the Land, a group that he helped found. The group is now listed on the Occupy Our Homes website as an "ally." Rameau's "liberations" mostly helped people of color. "The Occupy side," Rameau said, "has mainly happened with young whites." Now he hopes that with the help of the Occupy movement, community groups like his can mainstream their fight against the banks. But as Occupiers move into neighborhoods hit hard by the foreclosure crisis, they will be greeted by a confounding knot of problems that Take Back the Land has been wrestling with for years: race, responsibility and property. 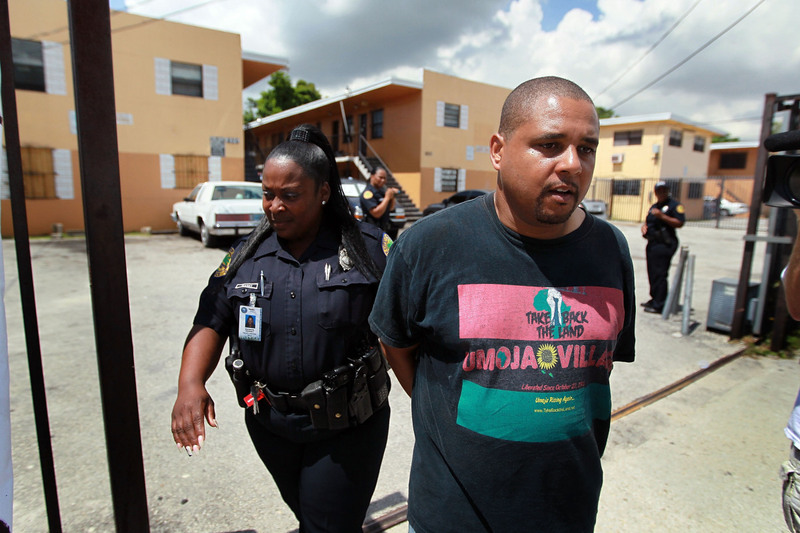 Take Back the Land's struggles in Miami started in a vacant lot in Liberty City. Fed up with gentrification, the group moved on October 2006 to set up a makeshift village of shanties made from shipping pallets and cardboard. They quickly rebranded the plot Umoja Village; the first word is Swahili for "unity." They were responding to the human impact of the housing bubble, what Rameau calls a mentality of "gentrification: buy low, fix up, sell high." In April 2007 the village burnt to the ground in a furiously quick fire. No one was seriously harmed. Just as it was forced out of its Liberty City lot, however, Take Back the Land was expanding its scope. The group's playing field had become the whole state of Florida, hit hard by the foreclosure crisis. In February 2007, even as foreclosure filings dropped nationally over the previous month by 4 percent, Florida's shot up by 63.5 percent, according to RealtyTrac. It was a harbinger of things to come. After Mary Trody's mother stopped making payments on the family's house northwest of Miami, her family was evicted in February 2009 -- but Take Back the Land and another local group that Trody is a member of, the Miami Workers Center, very publicly moved them back in, with TV stations, a crew sent by filmmaker Michael Moore, and the Miami Herald looking on. "If it's worth fighting for, yes, I would say the same thing: take arrests," Trody said. "That's the only thing that's going to make a difference. If we organize. If we stand together and try to show the world." The struggles Take Back the Land has encountered since late 2007 in legalizing their "liberations" may serve as lessons for the people taking part in Occupy Our Homes. Trody's family house, for example, has seen a parade of four owners since the eviction defense, none of whom have been willing to settle on terms to let them stay. Today, Take Back the Land has stopped moving in families to newly "liberated" properties. Rameau and other core members have left or are leaving Miami for other opportunities. "We haven't won homes. We haven't changed people's lives," Rameau said. Without more public pressure on banks, he said, Take Back the Land's successes could only be incremental. "We were only doing defense," Rameau said. On Tuesday, with the help of Occupy Wall Street, Occupy Our Homes will begin. Activists in dozens of cities -- some members of the Take Back the Land affiliates that have sprouted in Atlanta, Chicago, New York, Portland, Washington, DC, and more -- will be following the group's example. They hope to shame banks into cutting mortgage payments or creating a "right to rent" foreclosed properties. As actions begin, however, Take Back the Land members say the Occupiers should know what they're getting into. "Leak in the roof, water, electricity's out, whatever minor issue -- I think it's something we did not necessarily foresee as becoming our responsibility, in terms of providing social services, which is what it ended up being in addition to it being a political organization. And that's very stressful," said Mamyrah Prosper, another activist with Take Back the Land. The toll on families who move into "liberated" houses, too, can sometimes be taxing. Since Trody's family defended their house, they have been living in it without any sort of agreement from its owners, under constant threat of eviction or arrest. The Ramoses have had their house broken into twice. If occupiers are white, meanwhile, they may also end up moving into the black or Latino communities that have been hit hardest by the foreclosure crisis. Rebecca Wood, a white, 30-year-old self-described anarchist who is a supporter of Take Back the Land, said the group "was very intentionally black-led and focused on working within black communities and working towards self-determination for those communities." "I think that that's a pretty different goal than continuing the occupation through the winter," she said. Rameau drew a contrast between the mostly white "occupiers" and the more diverse "liberators." The occupiers, he thinks, should take actions like sitting down in banks in "direct confrontation with core parts of the system." "How does that manifest itself for the liberate side?" he asked. "That manifests itself in home liberations." If and when the Occupiers move families into houses that they have not previously inhabited, they will be running up against some very strongly held beliefs about ownership. The goal of Take Back the Land, Prosper said, was to change the framework: to make people think about "moving away from what's legal versus illegal into just versus unjust." "Some of us just challenged the whole notion of private property, period," said Prosper. "If you go that route so radically, you're going to ostracize yourself." Still, there is precedent in the United States for squatters taking possession of homes. On New York's Lower East side, residents were able to eventually gain control of buildings on East Seventh Street. The Ramos family would welcome any help it can get. At the mention of the Occupy movement, Mrs. Ramos beams. She doesn't ever want to leave her house, she said, "because as human beings we have the right to live dignified in a home."